Over the past century philosophers and intellectual historians have repeatedly called attention to the important, behind-the-scenes function of archives: on the one hand they constitute the evidence for historical memory; on the other they effectively erase anything that their gatekeepers deem unworthy or objectionable. Following the postwar demise of technological optimism, Foucault redefined the archive in the 1960s as the essentially repressive ‘law of what can be said’, the control of evidence by the powerful. For artists from Christian Boltanski to Gerhard Richter, the holes in archives are the traces of trauma. Silence becomes evidence of the unsayable. In reaction to this despondency, artists of the 1990s began to construct alternative archives: repositories of the forgotten, the fictive, the coincidental, the everyday. Accordingly, the premise of Paul McCarthy’s Low Life Slow Life is that the subjectivity of a personal account (the book is based on his 2008-09 ‘Low Life Slow Life’ exhibitions in San Francisco) might yield some greater meaning than the manipulative pseudo-objectivity of a museum-led show. The materials have been drawn from McCarthy’s personal archives. Uncaptioned images of art, performances, newspaper clippings and book pages appear not chronologically but in the order of their meaning to him. The cheerful Tide box that contains the book is emblematic of the constructive impulse implicit in the alternative archives of the last two decades. For McCarthy, the box recalls his introduction to sculpture while rearranging stocks in his father’s grocery store in the late 1950s. But the box also recalls Andy Warhol’s Brillo boxes, those scathing critiques of the cult of the new. McCarthy’s art has always burst beyond the box, invading the realm of performance, video and open-air sculpture. If we bring Warhol’s criticism of consumerism into its present context – as McCarthy does by reproducing images of the Brillo boxes – we see yet another instance of Pop Art up for redemption. For what is more renewing, than a trip through the archives and a thorough clean out of dusty shelves? Project Project’s matrix / Berkeley retrospective seems initially to take a similarly institution-critical approach, but this time the impulse to critique has been met with an earnest attempt to reveal all. Each exhibition in the 30-year history of the University of Berkeley’s art space is presented in layers of correspondence, photographs, invitations and reviews. ‘So rather than imposing a singular interpretation upon the history of the series,’ writes curator Elizabeth Thomas, ‘this book was conceived to … allow content and context to speak for themselves.’ The cover opposes McCarthy-like specificity with an expansive, document-strewn poster. 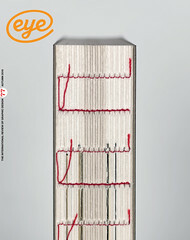 The book’s typefaces, too, have been chosen to avoid institutional interpretation: the text face, Computer Modern Bold, is part of an automatic typeface generation system invented by Donald Knuth in the 1970s; and Laurenz Brunner’s Akkurat Mono is a modern-day cousin of the typewriter face used for the original exhibition pamphlets. Although the motive is genuine, the lack of self-irony makes the book feel a little like a beautifully designed scrapbook. The art is impressive, the documents enlightening, the binding perfect – but who is judging and is judgement really possible? The difficulty with assessing either of these books is one of content and its presentation. Confronting the reader with a deluge of documents is in some sense a cop-out, an attempt on the part of author and designer to shun authoritarianism by avoiding judgement altogether. This ‘archival impulse’ has implications for the anti-design trend as well. In books that look like Word documents and posters scrawled in dried-up marker, we again find well intentioned designers seeking to confer the task of design upon the viewer / reader. In the case of default design, the viewer is presented not with all possible choices, but with a non-choice. ‘I didn’t want to presume to choose for you,’ says the designer with a shrug. But let’s consider our reader for a minute: the reader we want to empower to think, and to judge, for himself. As Hal Foster observed, often the death of the author / designer in archives and defaults has often meant not so much the birth of the reader as ‘the befuddlement of the viewer’. If McCarthy’s book is the more thoughtful, it is still the more opaque of the two. This opacity is critically rigorous, but potentially self-defeating. For almost worse than a bad conscience or a voice repressed is large-scale incomprehension and the anomie that comes with it: have we shored these documents against our own irrelevance? So perhaps the lesson, at least for designers, might go the other way. Can we turn archives to good? Although they define history and culture by exclusion, they allow us to orient ourselves as parts of a longer continuum. When we engage with the archive instead of exposing or rejecting it, we become responsible to the content of culture and the evidence for history. A cautiously positive view of the archive asks designers as archivists to take this responsibility seriously. Smaller than the archive, but necessary within it, designers order information and make it understandable.